A Philadelphia Police officer stands alongside a damaged Audi at Seventh Street and Packer Avenue, in Philadelphia, after fatal collision on Wednesday, Jan. 2, 2019. Prosecutors upgraded charges Tuesday to include murder and homicide by DUI against a Delaware man who police said stabbed himself before driving into an SUV in the early morning of Jan. 2 in South Philadelphia, killing three people including two Mummers. Keith Campbell, 29, who used a walker to enter the Philadelphia courtroom, was there for a scheduled hearing on his mental-health status. But prosecutors Joanne Pescatore and Anthony Voci asked Judge James M. DeLeon to amend the charges against Campbell to include three counts of third-degree murder and homicide by vehicle while DUI. Campbell, of Bear, Del., had been charged with three counts of homicide by vehicle in the deaths of Dennis Palandro Jr., Joseph Ferry, and Kelly Wiseley. He also faces one count of aggravated assault and related charges. (Left to right) Dennis Palandro Jr., wife Nicole, Kelly Wiseley, and Joseph Ferry. All four were driving in a 2014 Audi A4 along the 600 block of Packer Avenue on Jan. 2 when it was struck by a 2015 Acura RDX. Dennis Palandro, Wiseley, and Ferry were killed in the crash. Voci said the toxicology report showed that Campbell was under the influence of marijuana, amphetamine, and midazolam. Psychiatrist Robert W. Stanton performed a mental-health evaluation on Campbell in early March and deemed him competent to stand trial. Police said that at 1:45 a.m. Jan. 2, Campbell’s speeding Audi crossed the median in the 600 block of Packer Avenue, near the stadium complex, and into oncoming traffic, crashing into the SUV. Authorities later confirmed that Campbell had been pursued by police in Delaware shortly before the crash. 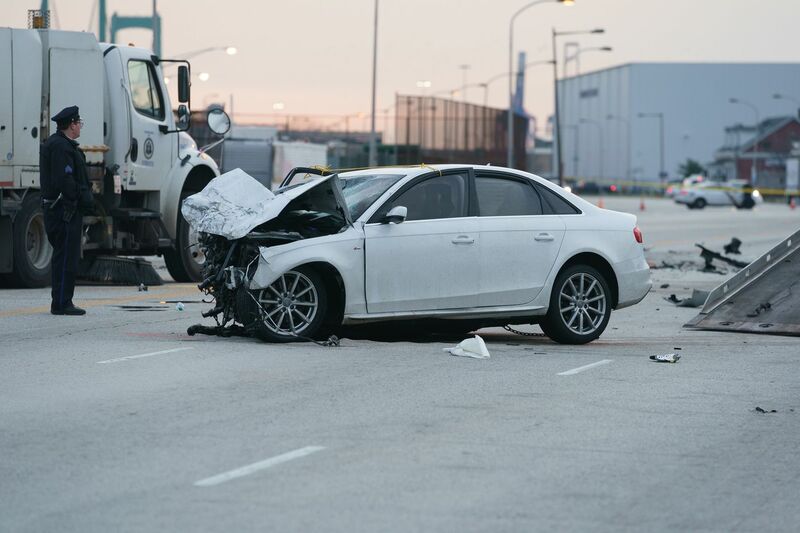 Ferry, 36, of South Philadelphia, was the driver of the SUV. Wiseley, 35, of Glenolden, and Palandro, 31, of Morton, were passengers. Ferry and Wiseley had recently been engaged. A fourth passenger, Palandro’s 30-year-old wife, Nicole, was critically injured but survived the crash. Ferry and Palandro were members of the South Philadelphia String Band, which came in second in its category at the Mummers Parade. Palandro was the son of Denny Palandro, the band’s captain. Wiseley was the daughter of retired Folcroft Borough Police Sgt. William Wiseley. Campbell’s next court appearance is scheduled for May 21. This article has been updated to more accurately describe the effect of the collision on Nicole Palandro.